This entry was posted on October 11, 2016 by Jessica Anderson. Looking for something fun to spice up your Halloween bash? Consider hosting a contest, complete with prizes! There are all sorts of entertaining Halloween-themed games and activities to do with both kids and adults. Check out the 4 contest ideas blow with corresponding Halloween trophies for the winners. Halloween Trophies add hype to your spooky event! 1. Costume Contest - This is a no-brainer. 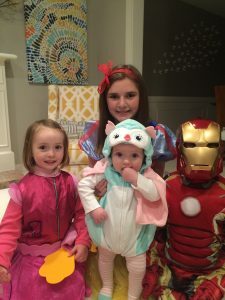 Everyone wears a costume to a Halloween party, so have your guests vote for their favorites! This can be done at a kids' party, adult bash, or at the office. My favorite award for 'Best Costume' is our Flying Witch Halloween Trophy. 2. Pumpkin Carving Contest - Your guests bring a pumpkin to the party and take home a carved jack-o-lantern. Put a big pot of soup on the stove, turn on some football, and it's the perfect fall activity! At our family pumpkin carving competition, we had a 'Kids Choice' prize and an 'Adults Choice' winner. 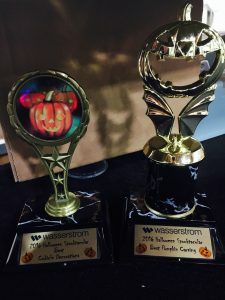 For awards, I like our Halloween Rising Star Trophy or Jack-O-Lantern Halloween Column Trophy, as they both have carved and can be personalized specifically for your event. 3. Office Cube Decorating Contest - Why leave all the fun to the kids? Get in the holiday spirit by hosting an office decorating competition. You can choose a theme (or not) and then bring your spooky vision to life in your cubicle! Once the office is decorated, host trick-or-treating for employees’ families to show it off. One thing to double check with management is what decorations are allowed, such as lights or candles. This type of event is the highlight of the year for many businesses! Don't forget prizes for the best decoration such as a Color Halloween Plaque to display in the office or a gift card to a neighboring coffee shop. A great game for gremlins of all ages is the Spooky Touch Boxes! 4. Spooky Touch Box - This is a fun game for a classroom party. An adult creates a box with a hole, large enough for a hand to fit through, but small enough so you can’t see inside. Within the box is a creepy item to feel. I usually do 4-6 touch boxes for a party. Each child takes a turn reaching their hand into each box, touching what is inside. Whoever guesses the most correct items in the boxes wins! Some ideas of things to put in the boxes are peeled grapes (for eyeballs), cold spaghetti (for brains), pumpkin guts (more brains), banana peel (for tongue), dried apricot (for ear). My friend put an antler in one of the boxes for her daughter's party and that really stumped the kids. Since the kids will get plenty of candy while trick-or-treating, I would suggest a non-edible prize. A Halloween themed pencil, glow stick, glow necklace, creepy ring or Halloween medal are all good, inexpensive prizes for the winner. I hope this gives you some fun ideas for your party and check out our large selection of Halloween Trophies here! Only 2 1/2 weeks until Halloween - hope yours is safe and fun!